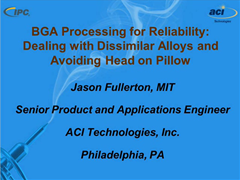 This presentation was given at the IPC Conference on Reliability: Assembly Process for a Reliable Product on November 1, 2011 in Irvine, CA. The presentation discusses conditions that impact the reliability of printed circuit board assemblies (PCBAs) that incorporate ball grid array (BGA) components. Mismatched solder alloys (between the BGA solder bump and the solder used in the manufacturing process) can cause a change in the reliability parameters of a BGA attachment. Methods of adjusting the manufacturing process to compensate for an alloy mismatch are presented. Also presented are methods to ensure a matching of alloys by modifications to the raw materials. The second condition presented is Head-on-Pillow (HOP). This condition is characterized by a lack of proper coalescence of the solder applied to the PCBA and the solder bump present on the as-received BGA component. This condition results in an open connection between the solder paste and the BGA bump. The effect of this condition on the functionality of the assembly will be presented. Potential cause factors from the manufacturing process, as well as preventative and corrective actions, are presented.